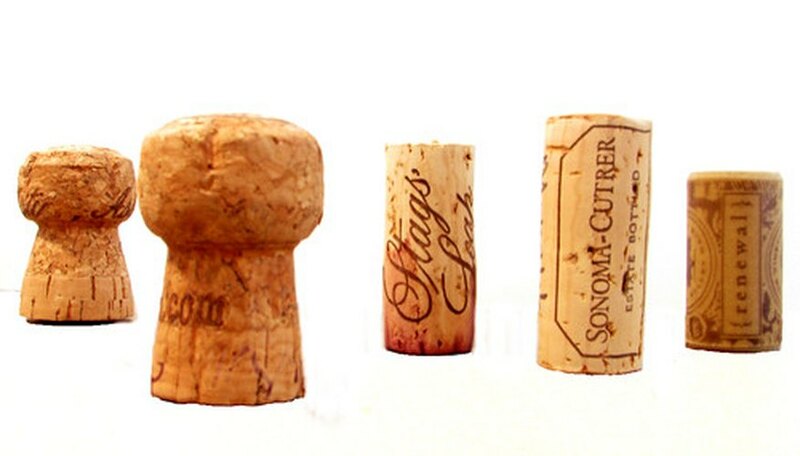 What Are Corks Made From? Cork is a pretty familiar material, but it is sometimes assumed wrongly to be the product of a great deal of factory processing. Instead, cork literally grows on trees and is very simple forestry product, and making corks for wine bottles involves only a few simple steps. The raw material for corks is the bark of the cork oak, an evergreen tree present in southwest Europe and northwest Africa. Cork bark contains a high proportion of suberin, a waxy substance that repels water. Once every 9 or 10 years, most of the bark is stripped from the trunk of a cork tree. The resulting thick planks are then left out in the open to dry and season. To make corks, planks of bark are boiled in water to clean them and improve their flexibility. The corks are then punched right out of the bark itself. Items like cork boards, cork liners and cork flooring are made by grinding up the cork planks and re-processing them, often using a glue or some other binding agent. The single largest producer of cork in the world is Portugal. This small country produces just over half of the world's total cork output.